Kevin Sorbo never gets a break. The Black Onyx is one of the most important games you’ve never heard of. Developed solely by Dutch developer Henk Rogers, the game was partially responsible for introducing standard role-playing-game mechanics into the Japanese gaming industry. Creating a party of warriors, turn-based fighting, exploring a cramped dungeon – Japanese gamers had never seen anything like this upon its release in 1984. It sold over 150,000 copies for the NEC PC-8801 (big numbers back then) and became massively influential almost overnight. When Dragon Quest emerged for the Famicom two years later in 1986, the development team behind the game said that The Black Onyx was their main influence. The rest is history. Japanese RPGS or JRPGs became increasingly more successful in the 80s and 90s, and eventually, broke through to Western and European markets in the mid-to-late 90s – specifically with the release of Final Fantasy VII. The Black Onyx, along with Wizardry, started it all. So what’s The Black Onyx doing on the SG-1000 in 1987? By this point, the game had been out for three years – a relative eternity in gaming, particularly in the 80s and 90s – and had already been released for the PC-88 and the MSX, both platforms which were much more successful than the SG-1000. Also, Sega had basically abandoned its original console by 1986 for the Mark III; so much so that The Black Onyx would be the last official Sega release that the console would see. Perhaps Sega wanted to push the boundaries of the SG-1000 or simply give the system a final hurrah. Either way, the game is certainly one of the system’s most ambitious titles, and while I’m not sure it came out the way Sega intended, I admire them for even attempting to port it. Hmm… I’m not seeing Kevin Sorbo in this lineup. In The Black Onyx, you create a one-to-five member party of warriors to explore dungeons under the town of Utsuro. It’s hard to tell what distinguishes the members of the group besides the color of their shirts. Each member looks exactly like the other, but their life bars are all a little different, which makes me think the color of their shirt corresponds to their stats (I didn’t find any evidence of this shirt/stat correspondence online or in the game, though, so I could just be making that up). The town itself looks like a dungeon, all corridors and claustrophobia. Normally, I wouldn’t suggest busting out the graph paper until after you leave the first town, but it’s worth it to make a small graph of Utsuro as well, if only for you to reference later. Utsuro has all that you need for the long road ahead, including weapons, armor, medicinal herbs, and pint upon pint of grog. While the town itself is painted mostly in a disastrous lime green, the doors to shops are always highlighted in red, so there’s no mistaking them. Once you’ve gotten what you need, proceed to the middle of town and into the dungeons below. No word on whether Schwarzenegger still owns this place. Before you get knee-deep in monster corpses, though, press Button II to bring up the menu. This allows you to see each member’s gold, change the speed of the in-game text, cure one another, quit the game and add a warrior. Many of these options are self-explanatory, but quitting the game and adding a warrior are worth elaborating upon. Since the game itself doesn’t have a battery backup, the game gives you a password to save each character. This might be a necessary evil, but wow, what commitment you have to have to jot down five passwords each time you want to save. As for adding warriors: if for some reason, you didn’t create the maximum amount of warriors from the get-go, you can sometimes recruit fighters from the town by talking to them during battles. This is a gamble, though, as some fighters would rather battle than talk. Queez, help me out here, what’s going on? Once you get into the dungeons proper, you’ll notice some niggling points that are common with early dungeon crawlers. Unless you make some graph paper (or use your iPhone – surely there’s an app for graph paper now?) and jot down your every move, you won’t know where you’re going. Every environment in the game looks the same: blue walls, red doors, lime green ceilings and floors. Also, fights occur every one to two steps. This is great in the beginning when you’re trying to level up your character and get some more gold, and bad when you’re actually trying to progress. The fights themselves are as basic as it gets. Once you engage the enemy, you’re given the option to battle with them, talk to them, or run away. Choose the battle option and pick which warrior will attack which enemy, then watch the fight. If your warrior dies, he’s dead and he’s not coming back – unless you have his password handy. 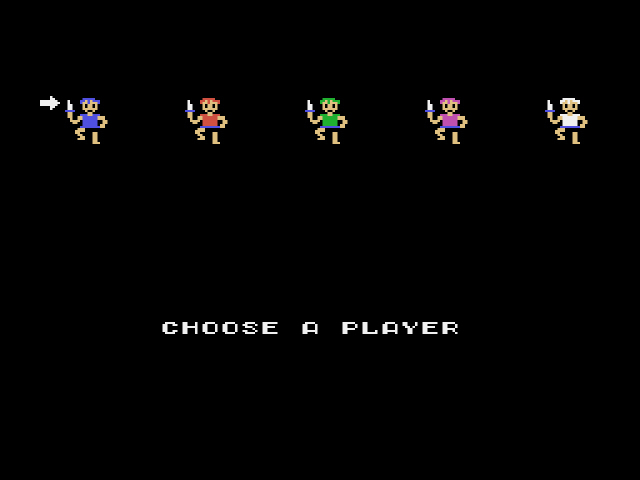 In the original Black Onyx release for the PC-88, the game had six floors of the dungeon, which lined up with the six colors the computer could display. You’re supposed to beat the floors in a certain order, but said order depends on the platform the game was released (at least according to my friend and yours, Wikipedia). Beating the floors in the correct order results in the creation of a stairway to the Black Tower, where you’ll find the Black Onyx and free the town of Utsuro from its curse of eternal darkness. The SG-1000 also has six floors to explore, but due to the console’s limited color palette, every floor looks the same, so I have no idea which order each floor should be beaten. There’s no FAQ/map available for the game online either, and believe me, I’ve looked. Basically, you’re taking your time and your sanity into your hands if you want to beat this game properly. You could beat all six floors, but if you don’t beat them in the right order, the stairway to the Tower doesn’t erect itself and you can’t beat the game. Ah, the cruelty. These zombies are… cold as ice. The Black Onyx was no doubt a revolutionary game upon its release in 1984, but the limited capabilities of the SG-1000 and Father Time himself cut severely into the game’s forgotten legacy. The dungeons: even when you know more or less where you’re going, it’s easy to get lost due to the port’s mind-numbing three-color scheme and tendency to flip you around without your consent when you hit a wall. The repetitive walk-and-fight gameplay may have been groundbreaking upon release, but it has aged into a tedious slog – particularly if you know all the fighting may be for naught if you’re not beating the dungeons in the proper order. Admittedly, the aforementioned are two large problems, but I do recommend gaming buffs give The Black Onyx a try. As a game, The Black Onyx suffers from the ravages of age and one’s own extensive knowledge and experience of the western and Japanese role-playing genre. As a piece of history, however, The Black Onyx deserves to be played, if only briefly, to imagine what it must have been like for young Japanese gamers going through an RPG for the first time. The experience, I imagine, was nothing short of revelatory. Great review Dylan, I struggle with early RPG’s at the best of times. The having to beat the floors in a certain order sounds an horrific ordeal. Is the order changed every game ? Or is it the same every game ? Perhaps one of your loyal followers could comment and tell everyone the correct order if indeed, the floor order is static. Then perhaps RPG lightweights like myself could get through the game. I’m not sure if the floors change orders for every game. Sean 697, what say you! They fought about the pub back in the 80s. In the end, they decided to have Schwarzenegger’s name on the pub, but other Arnold would still own half the rights. Watchoo Talkin’ Bout Everyone! Nice review of a tedious game (and yes, I’ve beaten it myself). I assume you’re using Bruce Tomlin’s translation patch for the ColecoVision adaptation of the SG-1000 port (which was then backported to the SG-1000)? If so, it might be worth giving credit, since his hack also includes several improvements/tweaks, and from what I understand it was a real hassle to implement. Thanks! And what order did you beat the floors in? I know I used Tomlin’s translation, but I didn’t use the improved version. Romhacking.net includes both the original with just text translation and the improved hack in their download. Regardless, I’ll give him props. Thanks for the edit! And oh lordy, I have no idea what order I used…I suspect I followed a walkthrough of some kind. And I should’ve put the term “beaten” in quotes since I abused the hell out of savestates; I just wanted to get through the thing and find out whether there was any gold at the end of this rainbow (there wasn’t).